Travel can be a real pain in the neck. From long security lines to tight airplane seats to cabin pressure headaches, even the most seasoned traveler can get weary. So if you are suffering from neck pain, this added ailment can feel like too much to bear. But while travel can wreak havoc on a chronically inflamed spine, many professionals have no choice but to grin and bear it to meet career demands. To help you make it through, here are some strategies to reduce neck pain during travel. Make good use of pillows. First, put a small pillow behind your low back. This offers important support and stabilization to your whole spine. Avoid neck strain by using an inflatable travel neck pillow. It keeps your head better aligned while resting. Consider bringing your own pillow from home for sleeping. Another option is to request special orthopedic pillows from the hotel. Some hotels even offer pillow menus for guests wanting to prevent neck pain. Moving your neck around during travel can keep the muscles relaxed. Hourly, drop your chin towards your chest and gently roll your neck from left to right in low circles. Repeat five times and then start again with the other side. Also, tip your ear toward your shoulder several times on both sides. Remember to keep your lower back moving too, since back pain can cause problems further up the spine. Pull your knee to your chest, switching sides, or gently arch backwards. Getting up and walking around every hour helps prevent muscle stiffness and neck pain. Maintaining your regular exercise routine at your travel destination should not be forgotten. Staying active will help sustain flexibility and fitness during your trip. Think carefully about your luggage choices. Wearing a heavy bag on one shoulder will throw off spinal alignment and tug on shoulder and neck muscles. If you must use this type of bag, at least switch it frequently from side to side. Backpacks balance out the weight but avoid allowing them to get too heavy, as that can also cause neck pain. In fact, work hard to limit the weight of all your luggage items. Packing light allows travelers to reduce muscle pain caused by hauling around heavy gear. 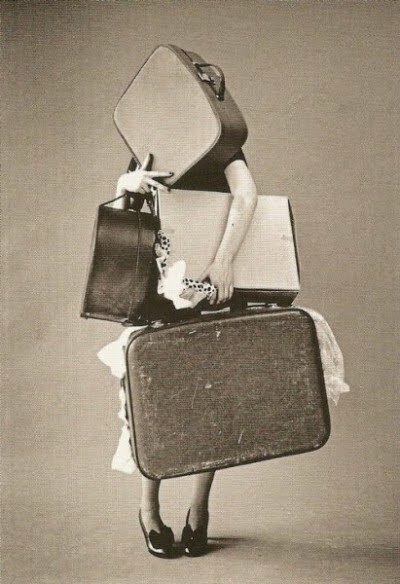 Dragging along a cumbersome suitcase can pull on your arms, neck and shoulders. Lifting a hefty carry-on bag into the overhead compartment can result in back and neck pain. Reducing the baggage weight will lessen these problems. Take care when lifting bags by bending knees and holding the item close. A few other important items should accompany you on your trip. Having a small, instant ice pack can bring relief when neck pain arises. Alternatively, take along a zip closure bag to hold ice cubes from a flight attendant or restaurant. When driving, keep a small cooler with ice packs nearby. Store pain medicine in your purse or laptop bag. If you will use your cell phone frequently, resist pinching your shoulder and neck by getting a headset. These work well to allow free hand movement and natural head position, especially while on the go. A few issues relate specifically to air travel. First, stay hydrated. Dehydration alone can cause pain. Keeping hydrated will also spur you to get up and move around the cabin. Instead of holding your book or magazine in your hands, support it with a pillow or clothing, perhaps utilizing the tray table. Pointing the airplane air nozzle directly at you creates drafts. Instead, direct it a bit away. Check out airport massages. They can relieve pain and prevent further escalation. To diminish overall travel stress and anxiety, employ travel preparations such as packing early, loading up bags the night before, curbside check-in, and online flight check-in. With some advanced planning and effort, neck pain can be successfully avoided while traveling. If back and neck pain are following you wherever you go, we can help! To learn more about how we approach back, neck and joint pain differently, download our FREE REPORT or visit us for an ASSESSMENT today!